What am I eating right now? What is going on right now? I will tell you. The seasons are about to change and that makes me look to food to inspire me. Dinner last night was Dungeness Crab- one of the most sustainable seafoods that we can eat right now. And, not to mention they are delicious! Thai coconut soup and a spicy salad of cilantro, cucumber, hot chiles, ginger, and lemongrass. Key ingredient? Lot’s of fish sauce. I am in love. In love with food! I did an event this past week in Pebble Beach for the ProAm with Jamie Lauren. It was fun hanging out with other chefs in the Monterey area. They are very talented and cook lots of local ingredients. Some of the foods at the event…red abalone, kumamotos, hamachi, geoduck, lamb, sliders, clam chowder, crab and shrimp cocktail and gnocchi! DELICIOUS! I made friends with Charles Phan and his sous chef, Perry- whom I adore, from Slanted Door. Good times. 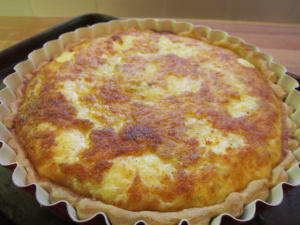 I want this quiche to be classic. To taste like time was spent and the ingredients are able to shine. This is not an easy dish to make, if you want to make it the right way. This is a morning in the kitchen, with the windows open and the scents wafting about your kitchen. It is the scent of good things to come. Always read through the entirerty of the recipe before you begin. Here we go! My short paste is made in the food processor. I don’t want to skimp, but come on! 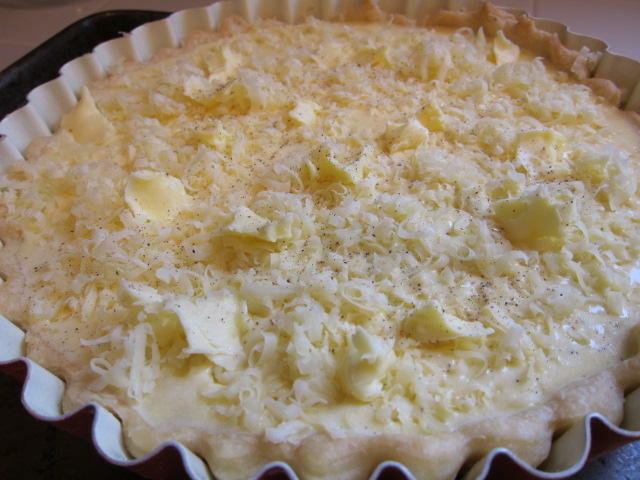 A good crust is usually, by French standards, 5 parts flour and 4 parts butter. The American all-purpose flour and butter usually produces a more brittle crust. By adding a bit of shortening (3 parts butter, 1 part shortening), a flaky and tender crust can be achieved. Measure the dry ingredients into the bowl of a 2 quart or larger food processor. 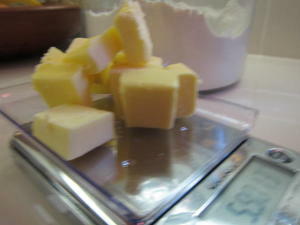 Add the butter pieces, and shortening. Pulse the motor 5 times. Turn on the food processor and add all of the ice water at once. Shut off the motor and pulse 3 times. Turn on the motor and add the last T of water. As soon as the dough forms around the blade, the dough is completed. Turn the dough out onto a lightly floured surface. With the heel of your hand (the palm is too warm), smear the dough away from you several times to incorporate all of the fat. In French, this is called the “frisage” or final blending. 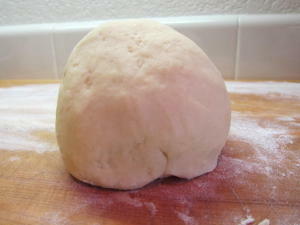 Scrape the dough into a ball and knead 4 times. 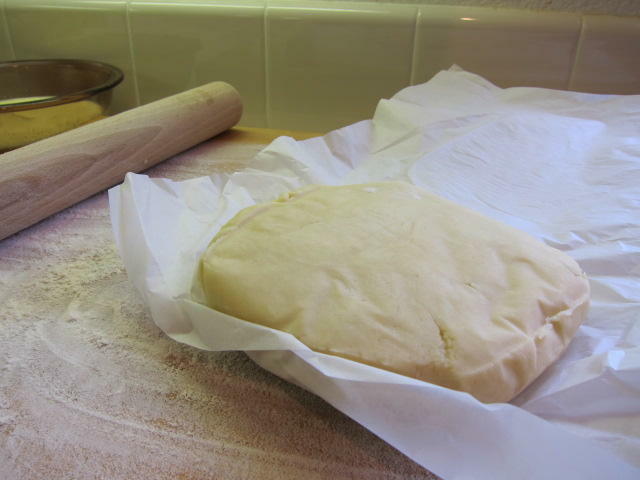 Sprinkle with flour, shape the dough into a disk shape and place in wax paper and then wrap airtight in plastic wrap. Place the dough in the freezer for 1 hour. I chose leek and emmantaler cheese. This is classic in quiche flavor profile, but again, I wanted classic. While the dough is chilling, make the filling. In a saucepan, heat the butter and chicken stock. Add the leeks and the salt. 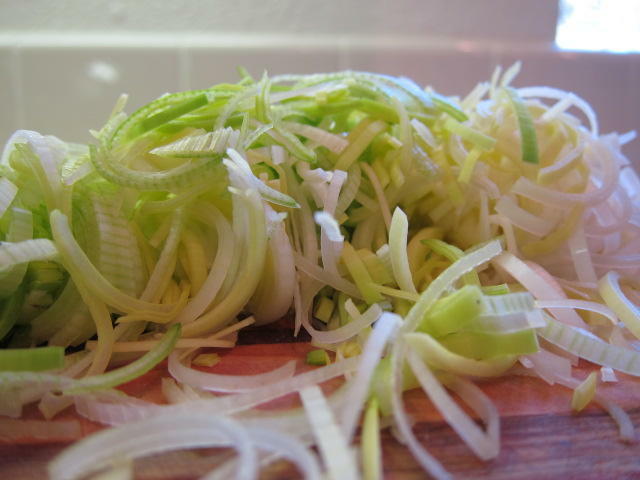 Cook for 15-20 minutes or until the leeks are tender. Remove from the heat and strain. In a medium bowl, whisk together 3 large farm fresh eggs. Whip the eggs to scramble them. Add the cream and the dry ingredients. Add the semi-cooled leeks and reseason. Set this aside. Preheat the oven to 400 degrees. Lightly flour your rolling pin and the top of the dough. Use your rolling pin to beat the top of the dough into a thinner disk shape. Roll the pin back and forth to get the dough loosened for rolling. Place your rolling pin in the center and roll the dough away from you. Be firm. Roll evenly. Lift and turn the dough to get to an 1/8 of an inch. Work quickly and use it immediately when it is to the correct thinness. Using a French tart pan, the one with the removable side ring, butter the sides. Roll your dough onto the rolling pin and unroll it over the mold. Press the dough lightly into the form of the pan. Make sure it fits the mold snuggly. 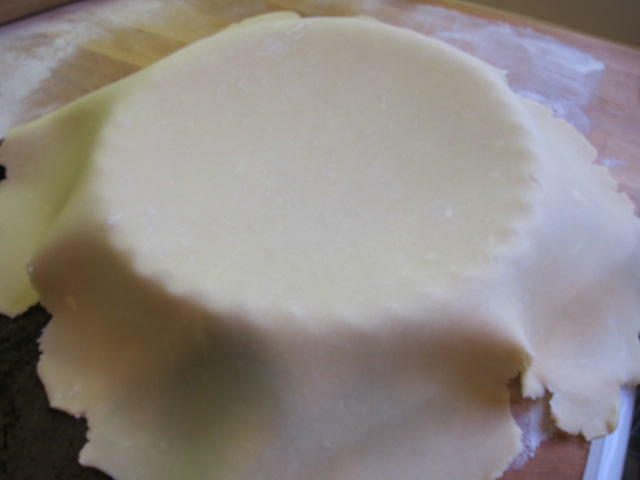 Trim off the excess dough with your fingers or by rolling the pin over the top of the mold. With a pairing knife, make cuts into the bottom of the pan in ½ inch intervals. You must “blind bake” the pie dough. 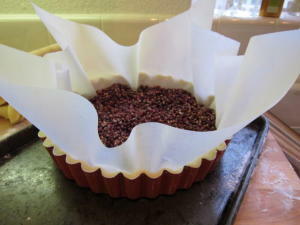 Use parchment paper to cover the bottom of the pan and continue it up and over the sides of the mold. Fill the pan with dried beans. This will ensure that the dough does not lift while baking and cause your filling to go over the sides! Place the tart mold onto a baking sheet. Bake the shell in the oven for 14 minutes. Remove the pan from the oven and remove the beans, and paper. Place the pan back in the oven and continue to cook for an additional 3 minutes. After 3 minutes, remove the pan from the oven and cool the partially cooked dough. 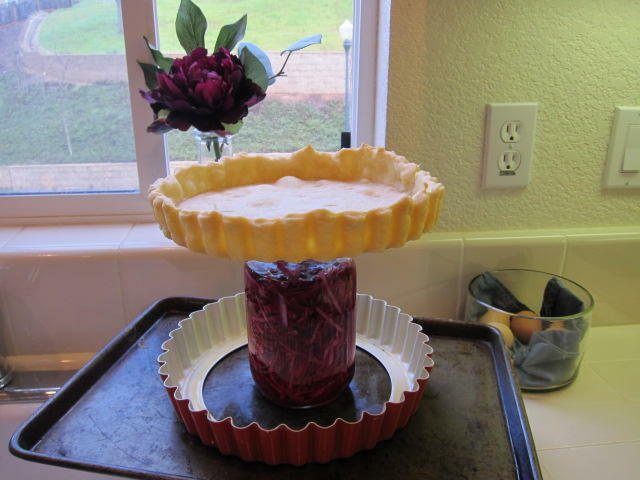 This is to keep your crust from being soggy. Lower the oven temperature to 375. Place a rack high in the oven. 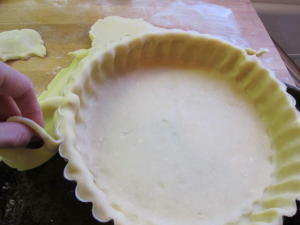 Pour the cooled leek mixture into the cooled pie shell. Sprinkle the cheese over the top and dot the cheese with the butter. Add a few cracks of fresh pepper to the top of the quiche. Place the pan in the oven and cook for 28 minutes or until browned and the eggs have puffed. The center of the quiche will be jiggly right out of the oven. It will set and sink a little. I hope you enjoy this! Please make it at home and let me know how it goes!